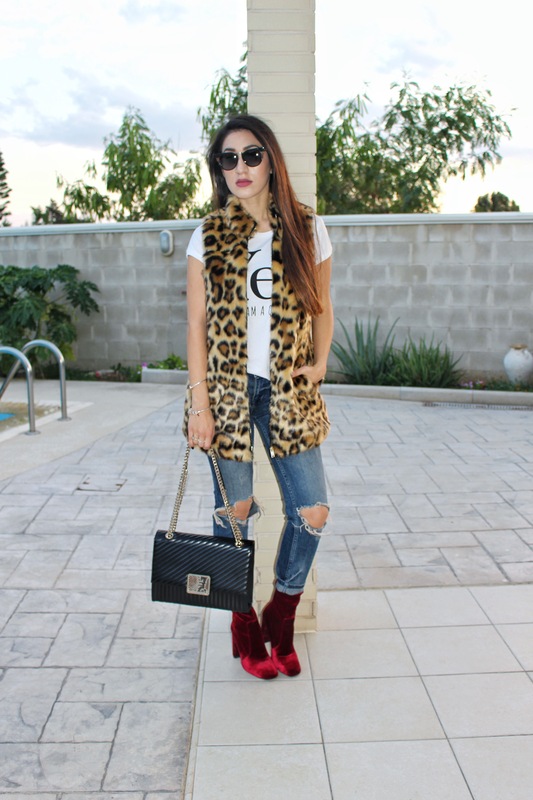 Four ways to wear Leopard Print – THE QUEEN'S CLOSET BY G.
How is everyone? I’m so happy that we’re already in November; my birthday month and a month away from Christmas. Today, I want to share with you some ideas on leopard print; a timeless trend that has been very popular over the years especially with Dolce & Gabbana and Roberto Cavalli but amongst other brands too. Animal print is every season popular, some times in big doses and sometimes in small. This season, it’s going to be one of the biggest trends and it comes in many different fabrics and materials; fur, wool, knit, velvet, sequins, etc. Personally, I really like leopard print however there are many different versions of leopard print and sometimes they might look a bit cheap so bare that in mind when in search of the perfect leopard item!! I like how an item in leopard can give attitude to our looks and make a statement while wearing the simplest outfit. 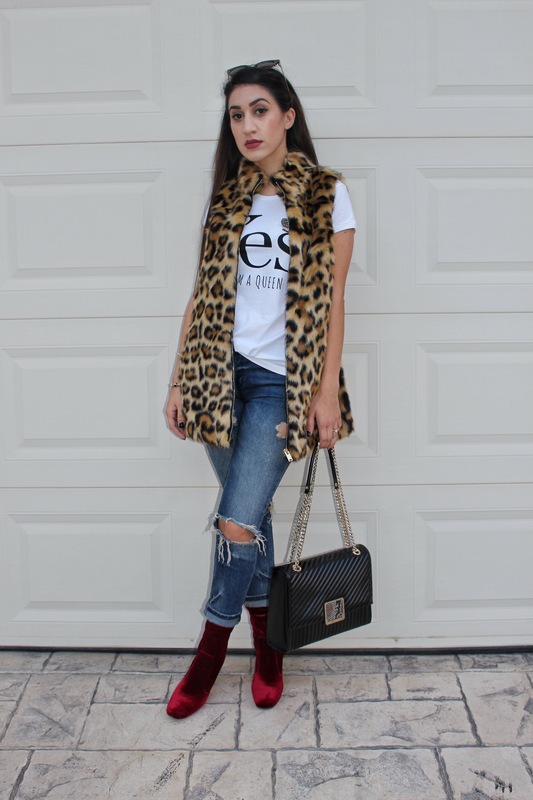 Many of you out there are might not wear leopard print on big surfaces such as a coat, so a pair of leopard booties or stilettos or a leopard handbag can still be as impressive as a garment. 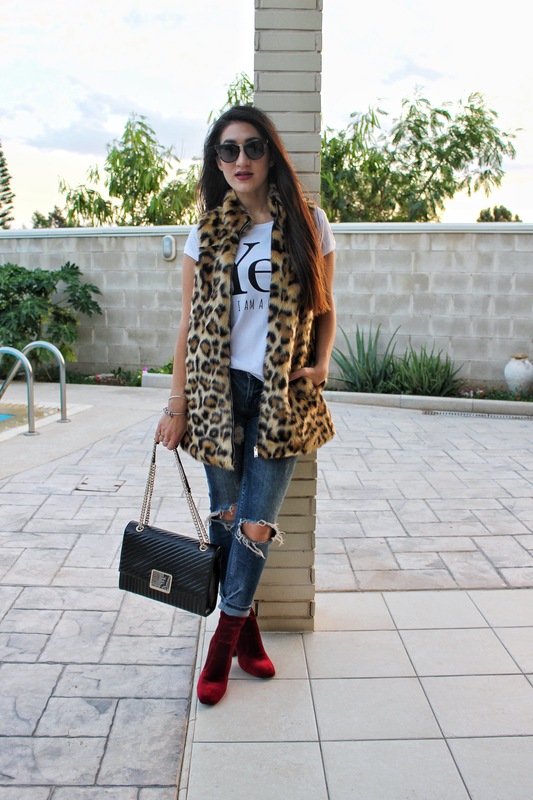 I created an all day look with a Silvian Heach leopard fur waistcoat matched effortless with a pair of ripled jeans and a Rinascimento white t-shirt. 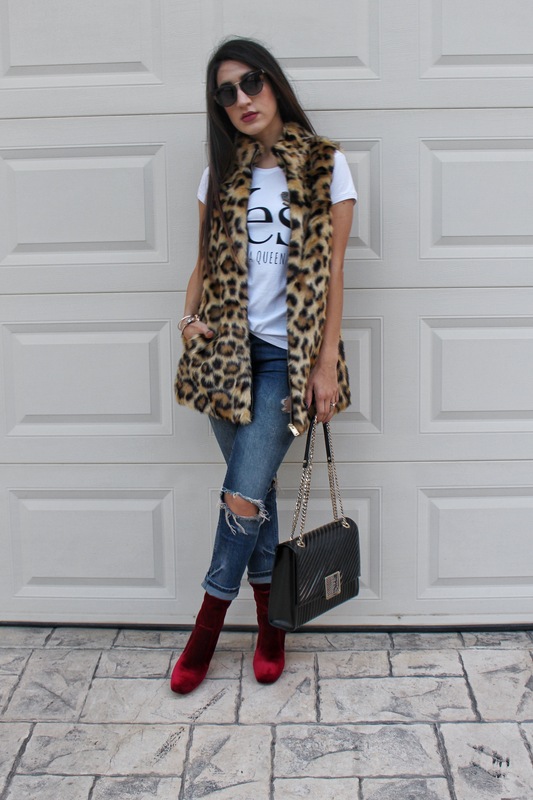 I wanted to add some colour to my look, so I felt that a pair of Sante bordeaux velvet ankle boots was ideal. I didn’t want to be very casual so I dressed the look a bit with a Cavalli Class classic bag. Leopard always looks good with total black so I created a total black look; a pair of Silvian Heach skinny black jeans, a velvet black kimono, ankle boots and a Byblos Blu handbag. What makes this look so interesting is the long knitted leopard cardigan by Silvian Heach, which I adore! Instead of living it loose, I decided to buckle it up with a Cavalli Class leather belt. This time I paired leopard with emerald green by wearing a pair of Dolce & Gabbana sunnies in green. 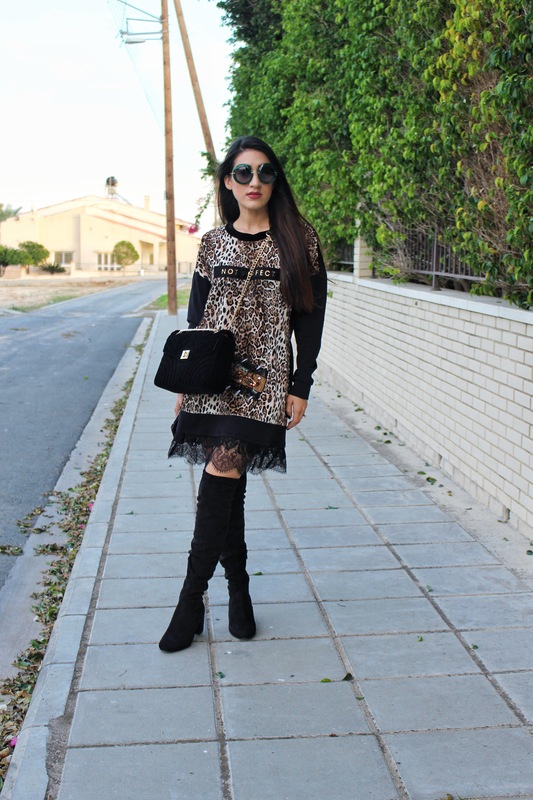 A velvet leopard sweater dress is the comfiest look you could aim for this Winter. I am wearing a Rinascimento dress with lace detailing. I teamed it with a pair of knee-high suede boots and a Silvian Heah velvet handbag. Find everything about this look on Lady in Red. As I have already mentioned, for those who will not dare to wear leopard in big surfaces, you can always follow the trend with an accessory. Here, I combined a total red look with a leopard handbag. Which look is your favourite? Comment below and tell me your thoughts. P.S Outfits from SHE Boutique. I love the leopard print myself and I also believe that it is such a statement element on an outfit. Great post and I really appreciated the personal effort you’ve put into your whole blog! 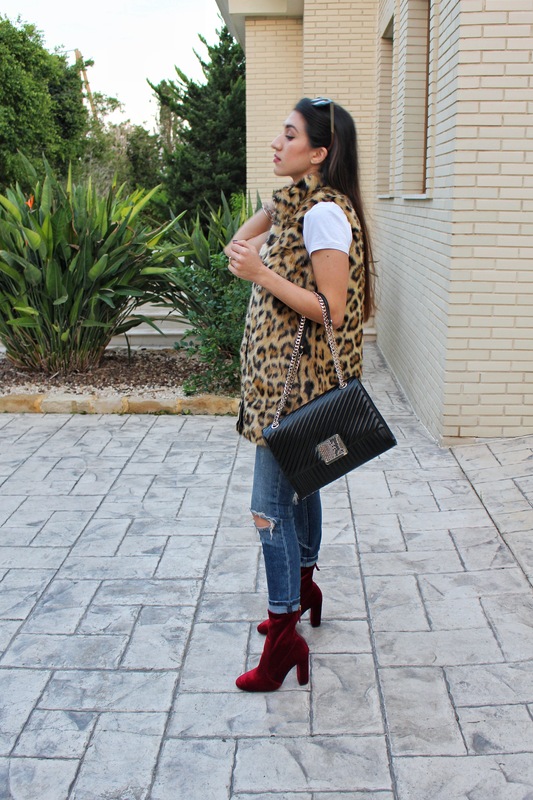 I have an animal print post on my blog as well.. Maybe you’d like to give it a look! Next Next post: It’s the season to be Jolly!